The Rollcentre boss had pleasant surprise to lift his gloomy mood last weekend – at the Le Mans Series Awards evening in Paris. The champions in each category were presented with their trophies – and then Martin Short was called up to receive a “Prix Special” on behalf of his Rollcentre Racing, which in his words “recognised our efforts and our miserably bad luck this year”. That story continues into 2007 as the English team jumps back up to LMP1, with its new Pescarolo chassis. The classic tale of misfortune occurred at Donington Park, with the broken ring gear indeed happening ten minutes from the end of the 1000 km. RML took the victory – and then received their massive dose of misfortune four weeks later at Jarama. That occurred six minutes from the end of the Spanish race. 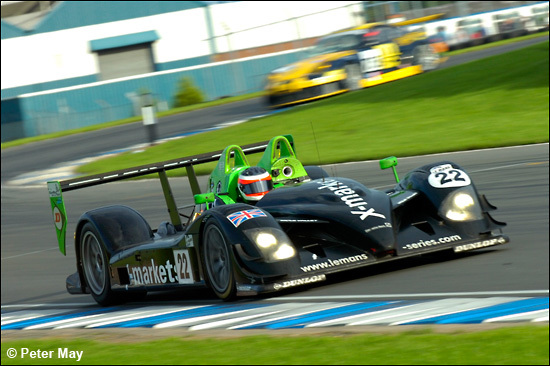 Here’s Rob Barff – when he looked to be stroking it home at Donington Park, in the Rollcentre Radical. More Rollcentre news on Wednesday.